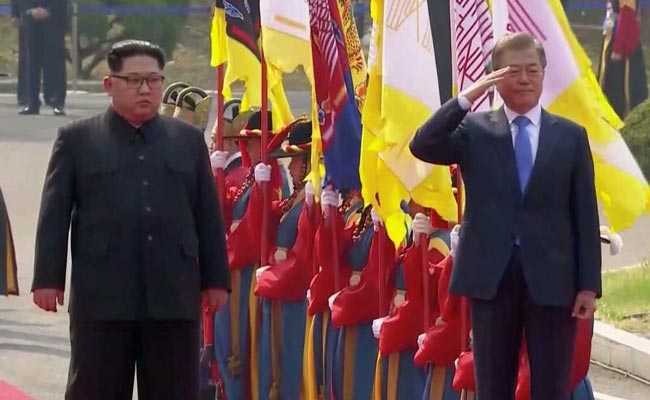 Korean Summit: Kim Jong Un greeted Moon Jae-in at the military demarcation line at 9:30 a.m. (0030 GMT), making Kim the first North Korean leader to set foot in the South since the 1950-53 Korean War. Kim Jong Un invited Moon Jae-in to step briefly across the demarcation line into North Korea. 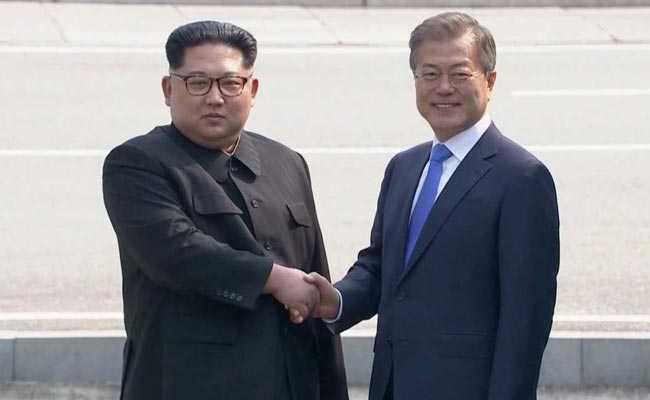 New Delhi: Smiling and holding hands, leaders of two Koreas met at historic summit at the heavily fortified demilitarised zone between the countries on Friday in the first summit for the two Koreas in over a decade. The meeting, aimed at ending their decades-long conflict and easing tensions over the North's nuclear weapons programme, comes weeks before Kim is due to meet U.S. President Donald Trump. 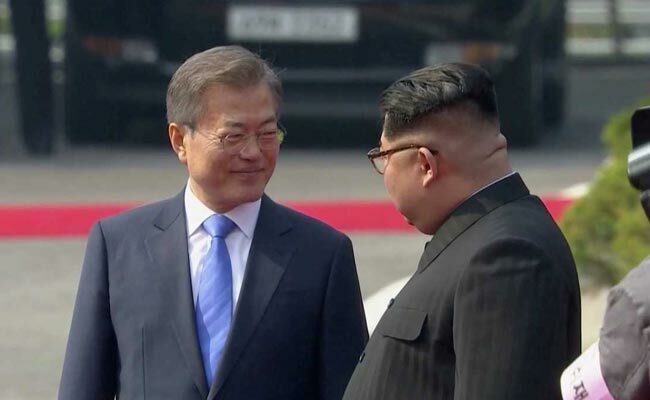 "I am happy to meet you," Moon told Kim before the visitor stepped over the line, making him the first North Korean leader to set foot in the South since the Korean War ended in an armistice 65 years ago. "The two leaders had a sincere and frank dialogue over the denuclearisation and the establishment of permanent peace of the Korean peninsula and development of inter-Korea ties," the South Korean President's spokesman said. The leaders of North and South Korea will be joined by their wives Ri Sol Ju and Kim Jung-sook for a banquet on Friday after the inter-Korean summit. Sources told news agency AFP that Kim Jong Un And Moon Jae-in discussed denuclearisation and permanent peace on peninsula. Kim Jong Un told Moon Jae-in that he was "flooded with emotion" at crossing into South Korea. 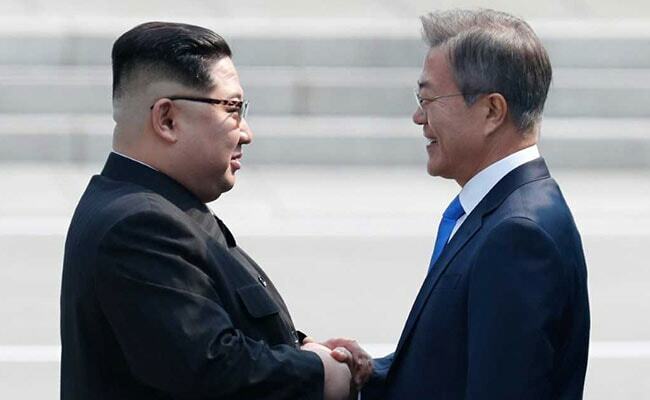 Moon Jae-in expressed hopes that after their summit at Panmunjom, "our meetings will continue at Pyongyang, Seoul, Jeju island and Paektu mountain" -- the island and mountain at the southern and northern ends of the Korean peninsula, reported news agency AFP. North Korean leader Kim Jong Un told the South's President Moon Jae-in on Friday he was willing to visit him in Seoul "any time if you invite me", Moon's spokesman said. The two previous summits between leaders of the Koreas, in 2000 and 2007, were in Pyongyang, the North's capital. North Korea and South Korea close first round of summit talks. 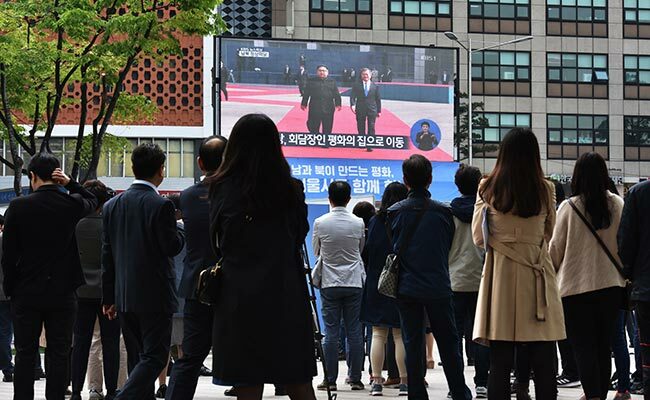 A crowd of people watching and taking photos of the moment Kim Jong Un and Moon Jae-in met. Kim Jong Un and Moon Jae-in to plant peace tree. "I came here determined to send a starting signal at the threshold of a new history," he told his host Moon Jae-in in the demilitarized zone, promising a "frank, serious and honest mindset". South Korean President Moon Jae-in told the North's leader Kim Jong Un that he hoped to see a "bold agreement" as they began their summit Friday. "I hope we engage in frank talks and reach a bold agreement so that we may give a big gift to the whole Korean people and the people who want peace," Moon said. Donald Trump's White House on Thursday voiced hope that a Korean summit would "achieve progress toward a future of peace," as the leaders of the two countries sat down to talk. 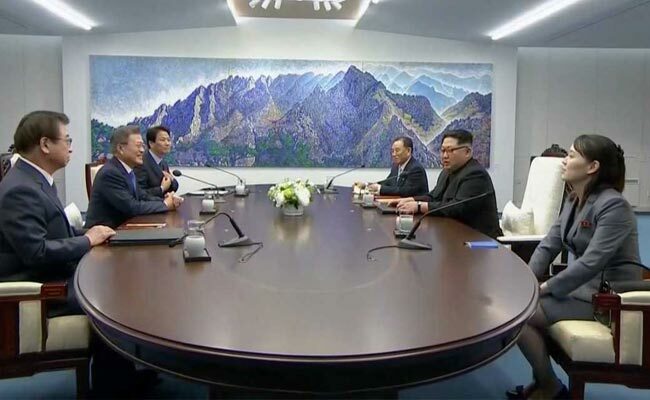 North Korean leader Kim Jong Un and the South's President Moon Jae-in sat down at an oval table to begin their inter-Korean summit Friday, television footage showed, according to AFP. 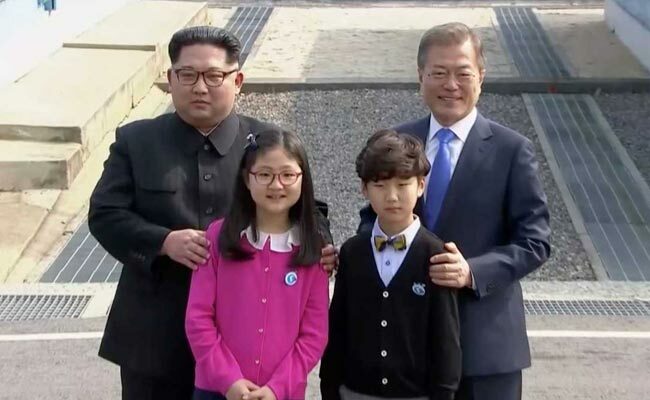 Kim and Moon were photographed with two children from Daeseong-dong, the South Korean village. They smiled and posed with the leaders at the start of the welcoming ceremony. 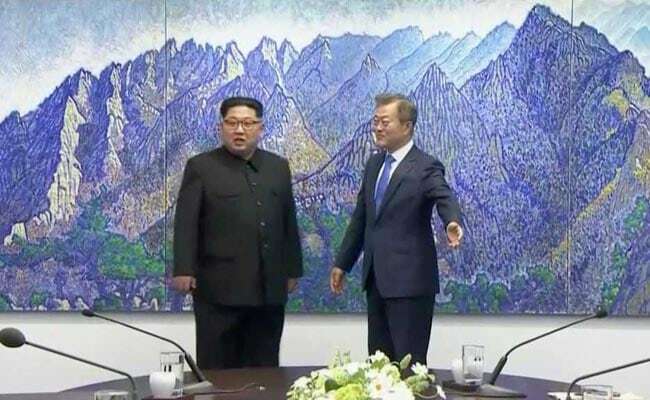 North Korean leader Kim Jong Un and the South's President Moon Jae-in shook hands Friday over the Military Demarcation Line that divides their countries in a gesture laden with symbolism ahead of a historic summit. North Korean leader Kim Jong Un crossed the border into South Korea for the first time today, where he was greeted by the South's president, Moon Jae-in ahead of the two Koreas' first summit in more than a decade.